It is harder than it looks to know how to take Easter. On the one hand it feels like an easy home run, a touchdown, a triumphal entry. But those were the kinds of thing we were celebrating last week. How then is this week different? For one thing it amazes how few people to whom Jesus appeared after the resurrection. One would think he would be taking out billboards all over town that said, “I told you so!” but he doesn’t. The first to see Jesus would be the last we would expect. 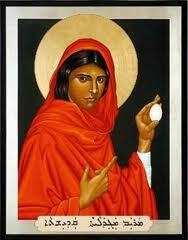 It was not the disciples, not even his family, but one of the worst outcasts of all of his company: Mary Magdalene. Of all of Jesus’ traveling disciples Mary Magdalene had the worst back story of them all. She was a woman, had been a prostitute, was poor, and was likely gravely ill. She was undoubtedly considered by most to be nothing more than a burden on society. She was a woman with a horrible reputation of whom it is said Jesus cast out seven ‘somethings:’ demons, illnesses, the deadly sins. Whatever they were they were enough to make her untouchable. So It mattered when Jesus befriended her. It mattered so much that in her grieving her desire kept drawing her back to the garden. She was obsessed. No wonder she was there first. It was not bells or trumpets that made her realized exactly what was going on, but the sound of a slightly familiar voice. She heard the sound of the first voice that loved her and she realized that her love had again found its home. That is the sound of Easter. It was not that Jesus spent several nights disappointing the disciples and came back and said, “Just kidding!” How cruel. He didn’t back-paddle and make it all go away. If anything it is to the disciples that he turns and says, “I told you so and I am back in order that we can now keep going.” He had preciously warned that they might even get killed, but God would have the final say on their lives. They were. God will. The mystery and hope of Easter is its wild secrecy. It does not say, “Ha! we were right all along.” It does not declare any particular human group the winner. Easter does not make up for our disappointment with God, but calls us into a better life beyond our disappointment. It says to follow these footsteps, to touch the untouchable, to love the outcast, the misfit, the lousy joiners and homesick souls, even if it gets us killed. It simply says this, “The impossible may take a little while.” Keep following. Disappointment With God: We are in over our heads. Face-palm Sunday: How Sincerity will keep Christians from being Christian. Oil Spill: How much should I worry about whether God will forgive me? Spies Like Us: This is how we are like Judas, and why that isn’t all bad news. How Many Hands Does it Take to Wash Two Feet? All of them , one of the most important stories of my life. “Unless Our Hopes Fall to the Ground and Die…” –We have some grieving to do, bbut not for Jesus. great reflection. one pushback: no where in Scripture is Mary Magdalene described as a prostitute.